Famous for having one of the 12 Jyotirlingas, Dwarka is best known as the home of Lord Krishna and will enchant you with the holiness that the air here carries. Located on the western tip of the Saurashtra peninsula in Gujarat, Dwarka is popularly known as the "home of Lord Krishna". The name Dwarka literally translates to dwar meaning 'door' and ka meaning 'moksha' meaning the ‘door to salvation. And so the aura of the religious town reverberates with spiritual holiness and chants of the devotees seeking moksha. Dwarka boasts of being the only city that is a part of both Char Dham (four principal holy places) and also Sapta Puris (seven holy cities) mentioned in the Hindu religion. For this reason, it enjoys a remarkable religious significance and attracts thousands of pilgrims all year round. In addition to this, the town is replete with grandeur temples, marvellous architecture and places of cultural significance. The beachside and the seashores are an added tourist attraction. Dwar, meaning door in Sanskrit, is believed to be the gateway to heaven. Legend has it that the city was once engulfed by the sea and recent excavations reveal that a city did exist here. 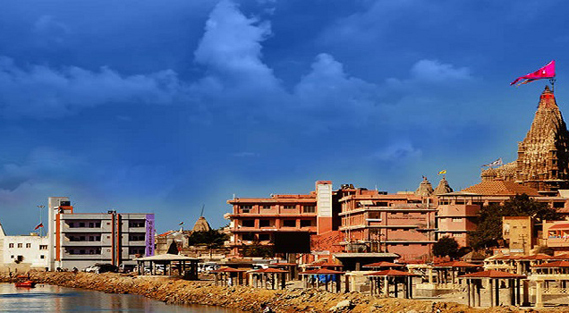 Dwarka can offer you the most spiritual and holy bit of Gujarat. The temples here have a culture and significance as rich as the legends, mythology and beliefs that surround them. They are also marvels and gems of architecture as they are of Hindu mythology. Your serene experience from the temples and the spiritual spirit of the town will only be complimented be the beaches that city has to offer. Dwarkadhish Temple also known as the Jagat Mandir, is a Chalukya styled architecture, dedicated to Lord Krishna. The town of Dwarka has its history dated back to the Kingdom of Dwaraka in Mahabharata. The five storied main shrine is grand and marvelous in itself constructed of limestone and sand. The 2200-year-old architecture, is believed to be built by Vajranabha, who constructed it over the land reclaimed from the sea by Lord Krishna. The black magnificent idol of Lord Krishna appears to be so appealing that devotees feel the presence of the lord before them. The temple showcases intricate sculptural detailing done by the ancestral dynasties that ruled the region. There are other shrines within the temple which are devoted to Subhadra, Balarama and Revathy, Vasudeva, Rukmini and many others. The devotees are expected to take a dip in the Gomti river before proceeding into the temple through the Swarg Dwar. The eve of Janmashtmi is the most special occasion in any Krishna temple, the Dwarkadhish temple is adorned by thousands of devotees chanting prayers and rituals. The shrine is a hive of colours, voices and faith transforming itself into inner silence and sanctity. One of the 12 famous self-existent temples, Nageshwara Jyotirlinga Temple too houses a curious myth about its origin. The giant, beautiful and artistic statue of Lord Shiva mesmerizes tourists and pilgrims alike with its aesthetic appeal. The temple is the hub of festivities on the eve of Shivratri when devotees turn up in enormous numbers. Along the Arabian Sea shore of Gujarat in Jamnagar lies the sprawling expanse of Dwarka Sea Beach. Second to none in terms of beauty, Dwarka Beach brings together elements of a fun day in the sun and the pilgrimage of a lifetime. Featuring the Dwarka Lighthouse, this stretch of sand is among the most popular beaches of Gujarat. The seashore itself has no temples but is quite close to Beyt Dwarka, which is an island full of temples off the shore of Dwarka, as well as temples in the main city. Full of reddish-orange sand that is unique to this region, Dwarka Beach is a beautiful place overlooking the Arabian Sea. The best thing about Dwarka Sea Beach is local fauna. Dolphins, porpoise, octopus, sea turtles, starfish, sea urchins, and many more species of aquatic animals and amphibians are common sights in and around Dwarka Beach in Gujarat. One of the best places to visit in Dwarka, this beach is wonderful for vacationing. The open sky saturated with ocean smells and sounds and a bit of sun and sand is just the right combination to relax. More importantly, Dwarka Beach is absolutely clean. Local hotels and camping on Dwarka Sea Beach are both equally good options. Local agencies offer many outdoor activities such as ferry rides from Okha to Beyt Dwarka, GopiTalab, and more places. On these ferry rides, many people throw nuts in the air and watch seagulls swoop in to feed. There are many attractive tourist spots close by as well. Beyt Dwarka itself has innumerable temples and a beautiful beach of its own. It is possible to do local sightseeing in Dwarka by boat, taxi, and on foot. Bhet Dwarka and Dwarka Lighthouse are nearby attractions from the beach in Dwarka. Dwarka Beach is not very far from Dwarkadhish Temple, which is one of the biggest tourist attractions in all of Dwarka. Tourist buses are available that makes round trips to nearby attractions with ample scope for exploration and photography. In fact, Dwarka Beach is one of the best places for photography in Gujarat with its active wildlife and brilliant sunsets. The beach is actually very relaxing and is seldom very crowded. It is quite possible to find a quiet spot to relax and rejuvenate. Dwarka Beach is also very close to Dwarka lighthouse, which is an ideal place to watch a sunset on the Arabian Sea. Located around 30 km from the main town of Dwarka Beyt Dwarka is a small island and was the main port in the region before the development of Okha. While the island is enclosed by a few temples, white sand beach and coral reefs, the beach is also popular among tourists for its marine life, sea excursions, camping and picnics. You can also enjoy water sports to make your trip a bit adventurous. Gomati Sangam Ghat is the sacred place where Gomati River flows. This ghat can be reached by climbing down 56 steps from the Swarga Dwar of the Dwarkadish Temple. The Gomati River, which is also known as the descended Ganges, meets the sea at the Chakratirtha Ghat. The Chakratirtha Ghat is famous for a wheel with white porous type stones, called as Dwarkashila or Chakrankitha. There are over 12 ghats surrounding the Gomati River, which are venues of Samudra Narayana Temple, Gomatiji Temple, the Panchanada and Chakra Narayana. The point where the Gomati River meets the ocean is known as the Gomati Sangam. On the river banks of Gomati, there is a holy Gomati Kund, where Rishi Durvasa was served by Lord Krishna. At this Gomati Kund, the Gomati River merges with the Arabian Sea and it is considered sacred to take bath here. Gomati Ghat features many temples including Shiva Temple and other smaller shrines of Lord Krishna and his friend Sudama. These temples can be reached by hiring a boat that gives a beautiful view of the entire town. A city very religious which offers sanctity to the people coming in it. A beacon for the pilgrims seeking divinity. The residing place of lord Krishna who led this society on a new path and enlightened the whole world with the knowledge of Bhagvad Geeta. The place which saw the flourishing, strong and prosperous Yadav dynasty. The land which nourished the future of the Yadav clan and stood witness to the carnage of the whole Yadav dynasty after the death of the almighty lord Krishna, Dwarka has seen much and still stands with the original settlement beneath the Arabian sea but a city nonetheless exists above the sea level. This city is one of the oldest cities that can there be in the whole world and has a very high importance in the lives of the Hindus as the city is mentioned in Char Dham as well as Sapt puri both and thus it is an important place of pilgrimage. The city holds many temples and although foreign tourists are not attracted by the temples of the city they do flock to the city dur to the rich culture of the city and beach along with the special mention of the Dwarka lighthouse. Yes, the religious city also holds a lighthouse which does not have anything to do with the sanctity of the city. The lighthouse which has an area of 18000 sq. metres is one of the major tourist attractions in the city if the temples are taken aside. The Dwarka lighthouse is situated on the shores of the Arabian sea and the lighthouse is open for visitation between 4pm to 6pm with the prior permission of the attendant. The lighthouse provides a serene or a calm environment for the tourists and the pilgrims to sit and spend their evenings and rest. The Dwarka lighthouse is situated on the Dwarka point on the Dwarka peninsula and the building is said to provide a panoramic view from the top. The lighthouse has a fixed sort of a light and it is situated above 70 feet or 21 metres above the sea level. The light from the Dwarka lighthouse has a maximum reach of about 16 kms and the lighthouse itself is 40 feet high and is situated about 107 metres from the point of highest sea level. There is a radio beacon provided in the Dwarka lighthouse which is powered by a renewable source of energy. The beacon uses photovoltaic cells to get power. The lighthouse has staff quarter, power house and inspection quarter and along with that a holiday home. Dwarka serves as the doorway to India's western parts. The word 'dwar' which means door, has given this place its name. Amongst the Holy Places in Dwarka, a popular name is that of Rukmini Temple, Dwarka. This small temple, positioned 1.5 kms to the north of the city, is an architectural masterwork. Rukmini Temple in Dwarka is devoted to Rukmini, the most important amongst Krishna's 16,108 wives. Rukmini Temple, Dwarka, India dates back to the 12th century. There is a story behind this temple. One day, Durvasa Muni, who was easily angered, was invited to dinner by Krishna and his wife, Rukmini. Etiquette dictates that when a person is invited to dinner, the host should refrain from eating until the guest has been satisfied. However, while Durvasa was eating, Rukmini became thirsty. She asked Krishna to help her. Krishna, to bail out his wife, put his foot in the ground. As a result, the Ganges waters streamed forth from the ground while Durvasa was not looking. As luck would have it, while Rukmini was drinking the water, Durvasa turned that way and saw her drinking without seeking his permission. This made him angry. He cursed her to live apart from Lord Krishna. That is the reason why Krishna's temple is in the city and hers is positioned outside the city. Gopi Talav which is a small pond encompassed by shimmering yellow sands is located at Surat in the Indian State of Gujarat. It was constructed during circa 1510 by a wealthy merchant and the then Governor of Surat named Malik Gopi. The Municipal Corporation of Surat later revamped Gopi Talav back in the year 2012. The surrounding areas were re-converted into an entertainment zone. An affluent Brahmin merchant named Malik Gopi who was residing in Surat has contributed a lot towards the development of the lake Gopi Talav. The lake got its name after the King of Gujarat, Gopi pura. He later added the word “Malik” to commemorate the King of Gujarat. The merchant approached numerous astrologers to assign a name to this place and decided to name it as “Surya pur”. The King of Gujarat who was against the Hindu community refused to accept the name and advised the merchant to name the place as “Surat”. Built by the industrialist family of Birla in 1970, it is constructed using white marble resulting in a magnificent and awe inspiring structure. The temple was made to capture and preserve the teachings and values of the Bhagavad Gita, the religious book of the Hindus. The walls of the temple have quotations from the Gita engraved in it. Accommodation for pilgrims is available within the temple premises. Bhadkeshwar Mahadev Mandir, dedicated to Lord Shiva, is an ancient temple, some 5000 years old, which was built around a self-manifested Shivaling found in the Arabian Sea. The temple gets submerged in the sea every year during monsoons, which devotees believe to be nature's way of performing the religious process of Abhishekam. For the rest of the year, the temple is visited often for its divine vibe and the scenic beauty of the attraction. A pedestrian bridge over Gomti river connects Jagat Mandir of mainland Dwarka and Panchnad or Panchkui Tirth on the island in southeast of it. The bridge was proposed in 2005 to boost tourism on the island. The island has religious as well archaeological significance. There are five sweet water well called Panchkui associated with five Pandava brothers of Mahabharata. Gomti river was crossed by boats till the construction of the bridge.As Jagat Mandir is Archaeological Survey of India (ASI) protected site, the permission was needed for the construction of bridge. The Vadodara circle of ASI gave nod to the bridge in 2008. The ground breaking ceremony for bridge was held on 5 May 2011 by Gujarat Tourism minister Jaynarayan Vyas and Rajya Sabha MP Parimal Nathwani. The construction of bridge delayed due as ASI Delhi did not granted permit until 2013. The bridge was completed in February 2016. Located very close to the beautiful seashore and the Dwarkadish temple, Swami Narayan Mandir is a divine shrine dedicated to Lord Swaminarayan, an avatar of Lord Vishnu. The shrine is a relatively new structure, however, the architecture, the sculptures and the bas-relief work on the structure is quite a treat to the eyes. The shrine is well maintained, clean and possesses a divine vibe that can calm a hassled mind down instantly. Engaged in creating Krishna Consciousness and propagating the teachings of Bhagwad Geeta, ISKCON?Dwarka?is a non-profit organisation and a major centre of Vedic Culture and Education. The centre was established by HH Mahavishnu Goswami Maharaj and ever since has played an important role in continuously helping devotees build their spiritual connection and live a fuller life through their programs. Dunny Point is situated at Beyt Dwarka, embraced by sea and coral islands. This is the first eco-tourism site in Gujarat, which is ideal for swimming and sunbathing. The site also features a wide variety of marine life, including dolphins, turtles, fishes and dugongs. Tourists indulge in several activities like bird watching, water polo, kite flying, meditation and cruise vacations. This site is located 30 km from Dwarka railway station and 22 km from Okha bus station. Additionally, it is also situated close to the Jamnagar airport, which makes it easier for tourists to visit this destination. The ideal time to visit this site is between November and May.